Although this little Mouse Garnish was designed to tempt very young grandsons to eat vegetables, it was much to our delight and astonishment that the teen guys thought the mice were pretty funny which brought an atmosphere of extra laughter and fun to the entire meal. So, Mousy is definitely a keeper in our household and we hope that it brings joy to yours as well. And Two Whole Cloves. That's it! 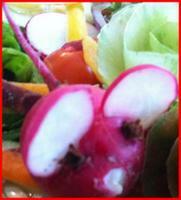 Look at the radish you plan to use for the body. Carefully decide which will be the top and which will be the underside. 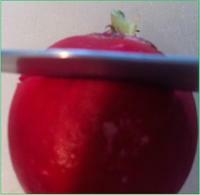 Shave a little piece from the underside so the radish will sit flat. 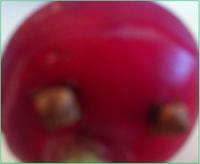 Determine where the eyes will be, take your skewer and push it through the radish where the first eye will go. Then do the same for the second eye. Gently insert the Cloves. 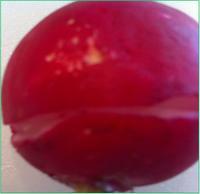 Next, using the eyes as a guide, with your paring knife carefully cut two slashes where the ears will be. 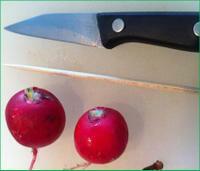 Cut two slices from the second radish. See if they fit into the sliced area which you have prepared for them. Press the ears gently but firmly into place and Mousy is done! Please remember whether you are cooking for adults or little ones, food is a gift of beauty and flavor. Use the best ingredients that you can manage and make it as creative and beautiful as you can.